Following are some of the MVC Interview Questions and Answers for Experienced. These questions are commonly asked in interviews and will also help you to get better understanding of the framework.These are some of the MVC Interview Questions and answers for experienced people.They cover some of the most important topics in MVC. To answer questions in any interview you should have understanding of basic concepts.If you have knowledge of basics then you will find it easier to answer questions related to more advanced scenarios. These mvc interview questions are segregated into different groups,so you can go through them when you are trying to brush up the main concepts in MVC. Controller receives the end user request,performs operations on the model as required and renders the view. What are the advantages of MVC? MVC encourages to implement the application using separation of concerns.This means that you can easily update either of the three components : model , view or controller without impacting the other components.View can be changed without the need to change model or controller.Similarly Controller or Business Logic can be updated easily without impacting the application. Since the components are independent so you can easily test the different components in isolation. MVC views contains HTML so you have full control over the view that will be rendered.Unlike WebForms no server controller are used which generates unwanted HTML. What are the main differences between ASP.NET WebForms and ASP.NET MVC? There is no proper separation of concerns,the application logic resides in the code behind of the webform ,so the .aspx page and its code behind are tightly coupled.This makes it difficult to make the changes in one without effecting the other. In the case of ASP.NET MVC there is a separation of concerns ,so the Model,View and Controller are loosely coupled.This means that we can easily make changes in one component without effecting the other components. Limited control over the generated HTML provides complete control over the generated HTML. Do we have ViewState in MVC? This is a very commonly asked question.It lets the interviewer judge your understanding of MVC.One big difference between WebForms and MVC is MVC does not have viewstate.The reason that MVC does not have viewstate is because viewstate is stored in a hidden field on the page.So this increases the size of the page significantly and impacts the page load time. In WebForms the URL’s are mapped to the physical files on the file system.But in the case of ASP.NET MVC URL’s are not mapped to the physical files but are mapped to the controllers and action methods.This mapping is done by the routing engine.To map the URL to the controllers and action methods ,the routing engine defines the routes.Based on the matching route the request is handled by the appropriate controller. Action methods are defined by the controllers ,urls are mapped to the action methods. The request which is received by our mvc application is ultimately handled by an action method.Action method generates the response in the form of ActionResult.The action method to execute is determined according to the routing rules defined by our application. ActionResult is a class which helps in creating decoupled application.Instead of returning specific type of result action method return an object of type ActionResult. ActionResult is a class which represents the result of an action method.Action methods returns an object of a type which derives from this ActionResult class.Since ActionResult is an abstract class so it provides few derived classes whose object the action method can return as the response.Also there are few methods available in the controller base class for creating objects of ActionResult derived classes,so we don’t need to explicitly create an object of the ActionResult and can just call the method. PartialViewResult PartialView Renders a partial view, which is a view which can be used inside another view. RedirectResult Redirect Redirects to different action method as specified in the URL. RedirectToRouteResult RedirectToRoute Redirects to another action method. ContentResult Content Returns the user supplied content type. JsonResult Json Returns a JSON object. HTML helpers are methods which returns HTML strings.There are few inbuilt HTML helpers which we can use.If the inbuilt helpers are not meeting our needs ,we can also create our custom HTML helpers.They are similar to the webforms controls as both the webforms controls and the MVC HTML helpers returns HTML. But HTML helpers are lightweight compared to the webforms controls. Exception filter executes last,after all other filters have executed. Explain about Razor view engine? View engine allows us to use server side code in web pages.This server side code is compiled on the server itself before getting sent to the browser. Razor and Web forms are the default view engines in MVC. Razor view have the extension cshtml for view containing c# code and vbhtml for views containing vb.net code. Inline expressions can be mixed with normal html and are not required to start with @. How to return JSON response from Action method? How do you generate hyperlink? What is OutputCaching in MVC? OutputCaching allows you to store the response of the action method for a specific duration.This helps in performance as the saved response is returned from the action method instead of creating a new response. Following action method will return the saved response for next 30 seconds. OutputCache attribute can be applied either to individual action methods or to the entire controller.If you apply it to the action method then the response of only that action method is cached. How do you manage unhandled exceptions in Action method? The HandleError Error attribute is used for managing unhandled exceptions in action method.In the absence of the HandleError attribute if an unhandled exception is thrown by an action method then the default error page is shown which displays sensitive application information to everybody. View Engines are responsible for generating the HTML from the views.Views contains HTML and source code in some programming language such as C#. View Engine generates HTML from the view which is returned to the browser and rendered.Two main View Engines are WebForms and Razor ,each has its own syntax. A large MVC application can consist of lots of controller, view and models. This makes the application difficult to manage. To manage the complexity of large MVC application you group the application in different areas based on the functionality. You create different areas for different functionalities. Each Area consists of controllers, views and models related to the functionality. For example an eCommerce application can consist of modules related to user registration, product management and billing. You can group these functionalities into corresponding areas. You create areas and use the same folder structure in Areas which you use to create a normal MVC application. Each Area has a different folder. In your action methods you need to retrieve data from the request and use that data.Model binding in MVC maps the data from the HTTP Request to the action method parameters.The repetitive task of retrieving data from the HTTPRequest is removed from the action method.This allows the code in the action method to focus only on the logic. What are ViewData, ViewBag and TempData ? ViewData, ViewBag and TempData are used for passing data from the controller to the view. ViewBag and ViewData are used to pass the data from the controller to the view while TempData can also pass the data from one controller to another controller or one action method to another action method.TempData uses session internally. This question is commonly asked if you have some work experience,more than 3 years, in developing MVC applications. What is the flow of the Request in MVC application? UrlRoutingModule searches the routes defined in the routes table. When a matching pattern for the requested URL is found ,corresponding controller and action method are determined. Execute() method of the controller class is invoked. Controller queries or updates the model and returns the view. 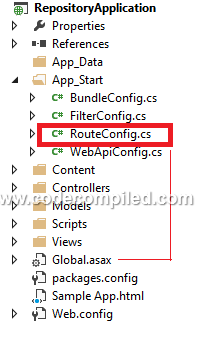 Where are the routes for the application defined? When the application starts ,the RegisterRoutes method is called from the application_start method of glabal.asax.In the RegisterRoutes method routes are added to the route table using the MapRoute method. Which assembly contains the ASP.NET MVC classes and interfaces? The main functionality of ASP.NET MVC is defined in the System.Web.Mvc assembly.It contains the classes and interfaces which supports the MVC functionality. System.Web.Mvc is the namespace which contains the classes used by the MVC application. What are strongly typed Helpers? In the case of normal helper methods we need to provide the string values to the helper methods.As these are string literals so there is no compile time checking and also intellisense support is available. intellisense support and also are type checked at compile time. The above razor block will set a common layout for all the views.We can included our own code also in _Layout.cshtml which we want execute before the code in any of the views is executed. It is a code generation framework for ASP.NET applications There are p reinstalled code generators for MVC and Web API projects in Visual Studio.It allows to quickly add common code such as code which interacts with data models. What are the new features of MVC 5? then your web page will make two separate HTTP requests to fetch the contents of Common.js and Common.cs.This results is some performance overhead.Bundling and Minification is used to overcome this performance overhead. Bundling reduces the number of HTTP requests made to the server by combining several files into a single bundle.Minification reduces the size of the individual files by removing unnecessary characters. You can enable Bundling by setting a property called EnableOptimizations in “BundleConfig.cs” in App_Start folder. 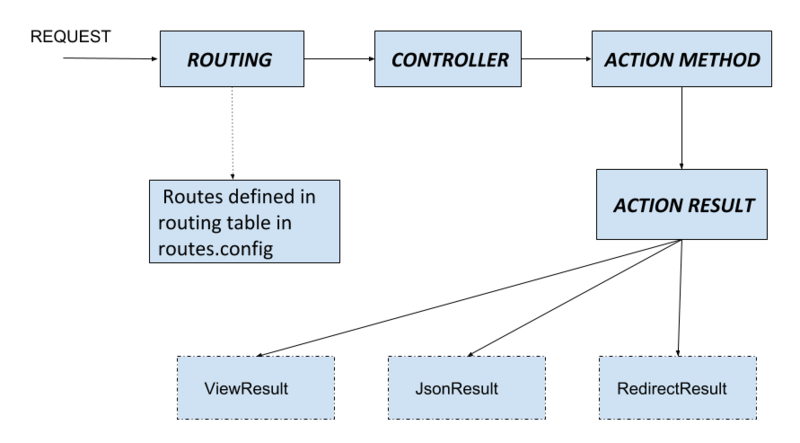 What is attribute routing in MVC? How can we prevent Cross Site Request Forgery(CSRF)? In MVC 6 ,the three frameworks,WebAPI ,MVC and SingnalR are merged into a single framework.Also in MVC dependency on System.Web is removed. Cross platform supports all the major OS such as Linux,Windows,Mac. Modular and Lightweight Unlike ASP.NET which was based on System.Web.dll,ASP.Core is consumed using Nuget packages.You only need to add the nuget packages you require for a specific functionality. These are some of the most important MVC interview questions and answers which you should know when attending MVC interview.These questions will not only help you with the interview but would also help in understanding MVC. better. Answers are well defined. Good one.